Jerilyn Brusseau has been baking cinnamon rolls with her mother and grandmother since she was 9. She grew up in a Snohomish, Washington farmhouse that was the center of hospitality. Every Sunday, the family enjoyed fried chicken, baked beans and Cinnamon Rolls. Brusseau is the creator of the franchised Cinnabon Cinnamon Roll, and it has become one of the culinary highlights of her career. Combine water, yeast and sugar in large mixing bowl and let stand 5 minutes. Add butter to cooling milk to soften. When cool, add milk mixture to yeast mixture and stir well. Add eggs and salt and stir well with wire whisk. Begin adding all-purpose flour, mixing well with wooden spoon until mixture resembles thick cake batter. Add raisins (optional). Add 2 1/2 cups whole wheat pastry flour. Mix well again until dough is quite sticky and begins to leave sides of bowl. Shape dough into ball and place in large greased bowl, turning to grease top. Cover with damp towel. Let rise in warm place about 45 minutes or until doubled in bulk. Mix together melted butter, brown sugar and ground cinnamon. Spread entire rectangle of dough with mixture (it should be very glossy in order to produce syrup). Sprinkle with walnuts. Roll rectangle tightly from long side (filling will be slightly runny and dough will be soft). Make sure seam side is on bottom. Shape with hands to make roll uniform in size from end to end. With very sharp knife, cut roll into 16 equal portions. Place side by side, cut sides up, in 2 well-greased 13 x 9 x 3-inch metal baking pans. (Glass pans will tend to caramelize syrup too quickly.) Cover with warm, damp towel and let rise in warm place 30 to 40 minutes or until almost doubled in size. Bake at 350ºF (180ºC) until nicely browned and filling is bubbly, about 35 minutes. Immediately invert onto serving platter or baking sheet, allowing syrup to drip from pan onto buns (this is the secret). If desired, spread cinna-buns with Cream Cheese Icing while still warm from the oven. Makes: 16 large cinnamon buns. With an electric mixer, combine cream cheese, butter (or margarine if uisng), vanilla, lemon flavoring, and powdered sugar. Beat well. Spread over WARM cinna-buns. You may want to add a few tablespoons of milk to achieve a thinner consistency for drizzling icing over cinna-buns. *Korintje Cinnamon can be purchased online at Penzey's Spices. Their web url is: http://www.penzeys.com or Korintje Cinnamon can be purchased at Whole Foods Stores. I've tried many different recipes....this is the best! Oh my god, these are exactly like the buns from cinna bons!!!! These are perfect in every way. The one thing that I do different is, instead of adding melted butter, I take the butter, soften and spread it all over the dough, then add the cinnamon. Easier to deal with when it's time to roll up. Soooo Soooo Goooood!!!!! My family screams with delight when they hear mom is making cinna buns, literally! we love these, some times we just use all whole wheat flour so we don't feel so guilty about having them. Don't know what happened, but the dough was way to soft and the goo had issues staying in when I rolled it up. The temperature seemed way too hot for the buns (I took your advice and did not use glass pans), so the syrup burned. The whole thing was disappointing and a total disaster. Easy to do the first time making them and the cream cheese icing was really delicious. I was wondering if you could freeze the unbaked finished product and if it will still be ok, that way I can just thaw it out and bake some whenever? I love them and so does my family. thank you! I loved these!!! My daughter made these for me and they turned out great. Instead of the cream cheese frosting she used the vanilla glaze recipe. They were the best cinnamon rolls ever!! They sound pretty delicious, i'll be sure to give them a try! A rather involved recipe but totally worth all the time and effort. Make sure you have lots of people to share them with because even one can knock your socks off! These are delicious! Be sure to check after 25 min of baking. Mine were a bit overdone and I cooked them for only 30 minutes...Regardless they were great! I made them parve (dairy-free) with parve margarine and non-dairy creamer. Instead of the cream cheese frosting, I made an icing from 2.5 cups powdered sugar, 1.5 Tbsp margarine, 1 Tbsp vanilla extract and 3 Tbsp non-dairy creamer. Yum! Unbelievably good! I've been baking bread things and trying new recipes for 50 years, and these are THE BEST! 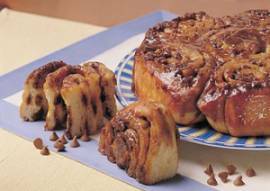 I no longer try cinnamon bun recipes - no need to, with this recipe! Thank you for sharing it with us! EVERYONE loves them and they are a cinch to make. I make the dough in my bread machine!...and love having them in the pans and ready to bake in the morning. Drooly-good! These are DELICIOUS! I did over-bake mine too and had a mess to clean up in the oven due to my pans not being deep enough. One thing I did was to cool the filling in the fridge to the point of softened butter to make it easier to spread and stay in place when rolling and cutting. It is important to invert them out of the pans while their still hot. I have made this recipe a few times, and it has turned out beautiful and delicious every time.